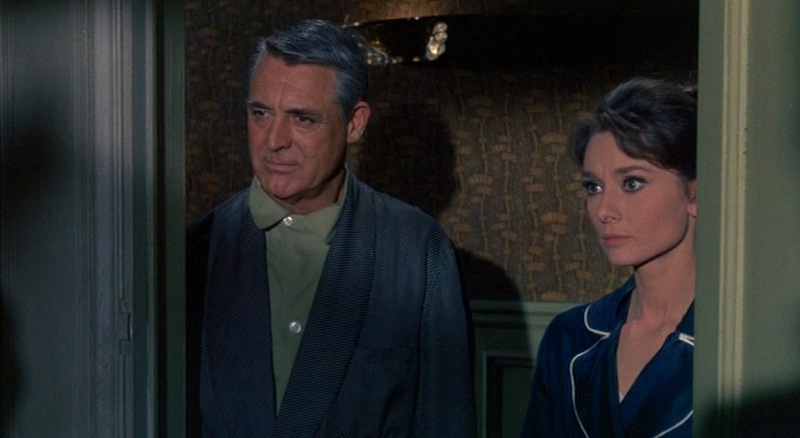 After yet another death in Paris, Reggie Lambert (Audrey Hepburn) and a man she now refers to as “Adam Canfield” are mustered from their sleep by the industrious Inspector Grandpierre (Jacques Marin), setting the two back on their search for the film’s MacGuffin in the middle of the night. “If I were you, I wouldn’t stay in my pajamas,” warns Inspector Grandpierre, although the mustached detective may be underestimating just how comfortable our hero is in his sleepwear. 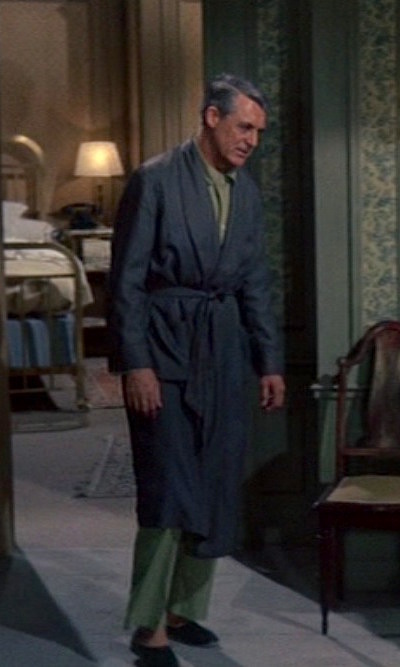 Cary answers the summons in a set of light green pajamas, over which he wears a full-length dressing gown in a navy and light green twill that blends to create a silky dark green finish. The dressing gown (or robe, if you will) has self-faced shawl lapels and ties with a full belt around the waist. The sleeves are cuffed, and there are three pockets – one slung low on the left side of the chest and one on each hip. 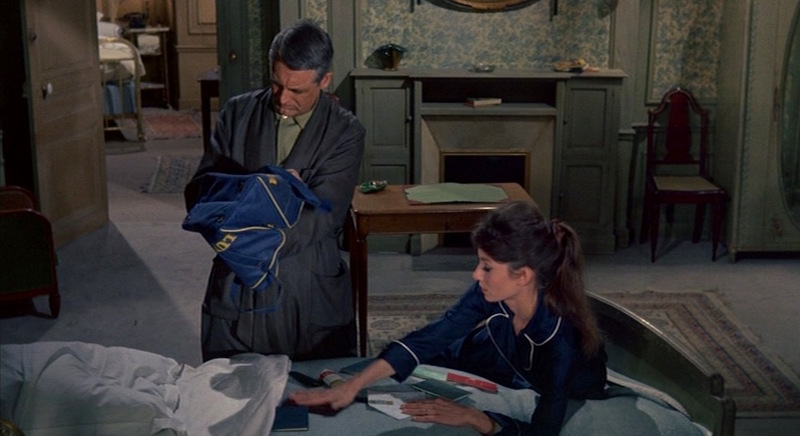 “Adam” and Mrs. Lambert rummage through her late husband’s Lufthansa bag for any potential clues. Cary’s cotton pajamas are a tranquil, light viridescent shade similar to laurel green. The pajama top has three large mother-of-pearl buttons up the front with a smaller button at the top that buttons under the shirt-style spread collar to cover the neck and chest. It appears to have a breast pocket and two hip pockets similar to the robe. The pajama pants are covered at the waist by the untucked pajama top and have plain-hemmed bottoms. 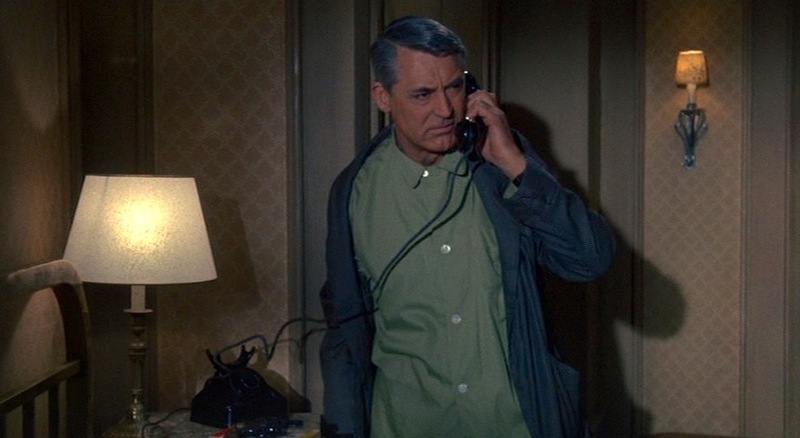 Cary’s character evidently sleeps with his wristwatch nearby as the plain black leather strap of his steel watch is visible on his left wrist under the loose sleeve of his pajama top. 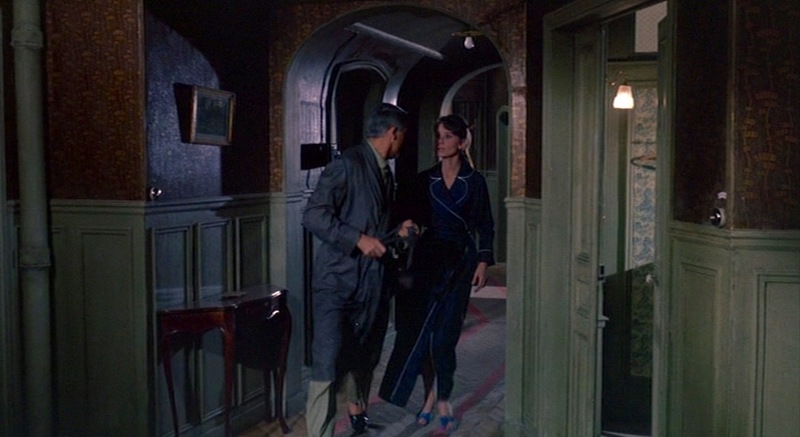 His black slippers brightly reflect the light in the hotel hallway, implying the possibility of patent leather uppers similar to a formal loafer. He wears them sans socks. “Adam” also briefly slips on his thick tortoise-framed eyeglasses which, despite Reggie’s initial insistence, he indeed needs for their prescription lenses. 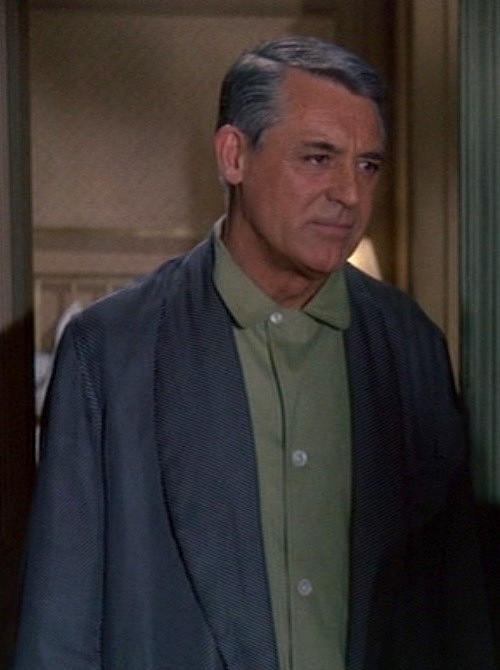 Fashionable yet comfortable loungewear à la Cary Grant would be far preferable to that dirty t-shirt and ripped flannel sweatpants should you find yourself wandering the halls of a hotel in the middle of the night. Check out the Criterion Collection version of this much released film; its years in the public domain have led to many video releases of lesser quality, but Criterion offers the best.